Whoever said it’s not possible to have ultimate luxury in the middle of the desert had obviously never heard of the Ritz-Carlton Ras Al Khaimah, Al Wadi Desert! Set in the Wadi Khadeja desert sanctuary, this exquisite resort offers one of the most exclusive resort experiences imaginable. 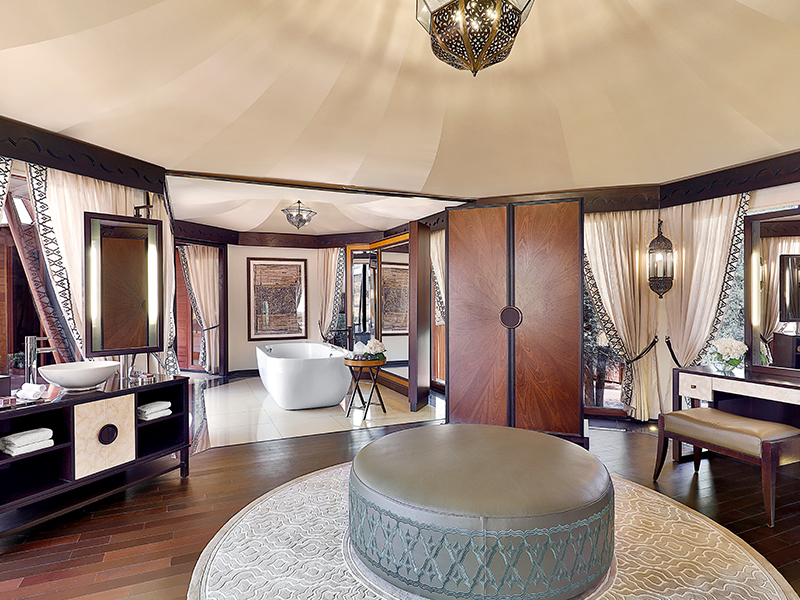 Think deluxe Bedouin villas, private pools and breathtaking scenery for days. This is the place where you can indulge in the complete 5-star experience away from the noise of the entire world! Inspired by nature, culture and tradition, Ritz-Carlton Ras Al Khaimah, Al Wadi Desert is a sight for sore eyes! With luxurious pool villas that borrow the best elements of Bedouin architecture, to the most sumptuous dining experiences and unique falconry shows, a stay here offers an experience like no other! 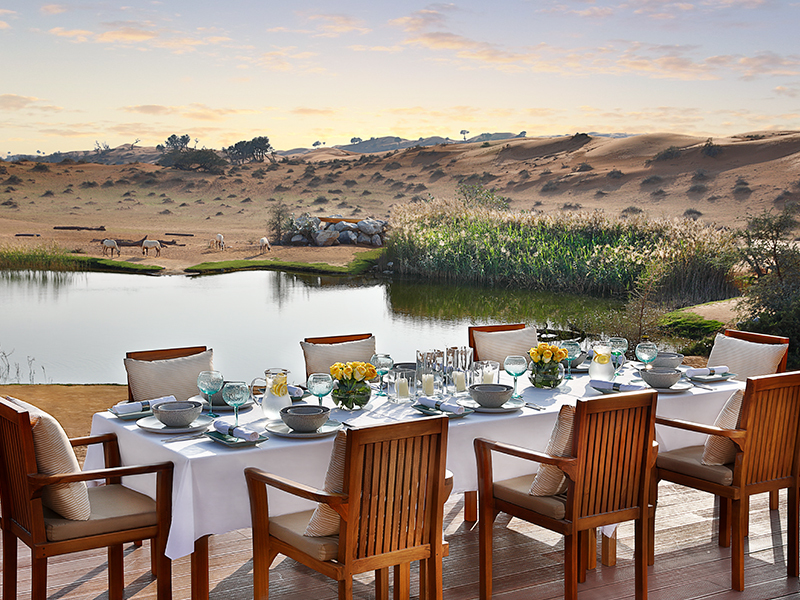 The Ritz-Carlton Ras Al Khaimah, Al Wadi Desert glows beneath the Arabian sun. It is set away from the thrum of the ever-growing Dubai metropolis and offers guests the chance to settle in, breathe the fresh air and fall asleep each night, calm, under a dazzling blanket of stars! Complete with day spa, outdoor activities, a Ritz Kids program and more, the whole family will enjoy escaping to this out-of-this-world resort! Why Go To Ritz-Carlton Ras Al Khaimah, Al Wadi Desert? With only 101 villas (each with private pools), Ritz-Carlton Ras Al Khaimah, Al Wadi Desert offers the complete boutique resort experience. Each luxurious villa offers the ultimate chance to retreat. 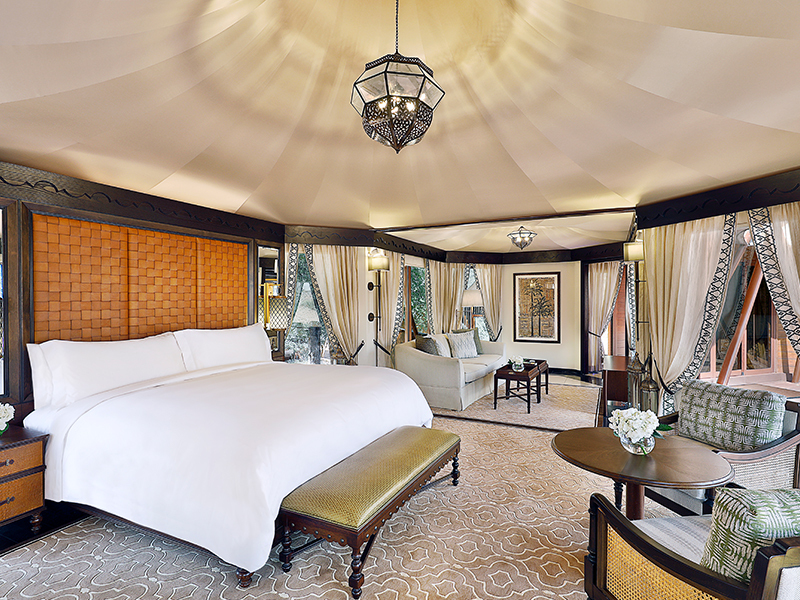 Spend hours on your sun lounge or day bed poolside or relax behind exotic curtains in the comfort of your spacious room. Access free Wi-Fi or watch LCD TV. When you’re rested and recharged, venture outside to experience the 5-star amenities dotted around the resort! 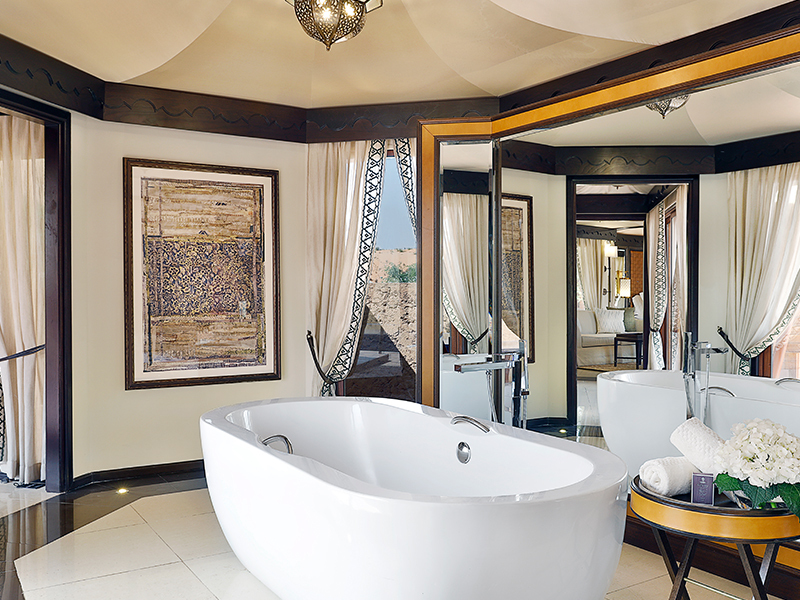 If you’re searching for world-class facilities, Ritz-Carlton Ras Al Khaimah, Al Wadi Desert is the place! Indulge in state-of-the-art hydrotherapy and a full range of treatments at the resort’s spa sanctuary. Experience the blend of local herbs, healing traditions and signature contemporary treatments and leave feeling relieved of all ailments—completely restored! Next, embrace the unique activities on offer at the resort. From archery to camel rides, nature walks, bird watching, biking, star gazing and more, you’ll be able to fill every moment with a unique, unforgettable experience! 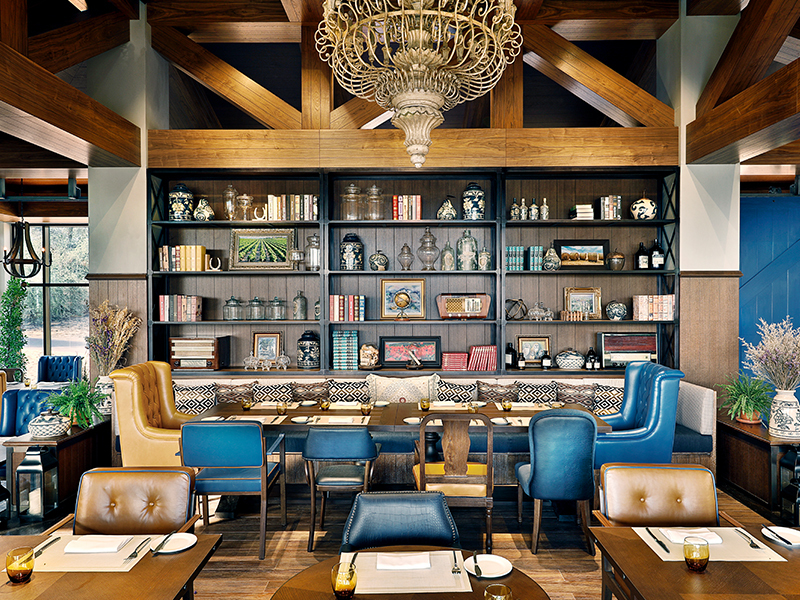 Feast on carefully crafted culinary delights at 6 incredible venues. Dining experiences include the Moon Bar roof terrace, Al Wadi Tower private specialty dining and exclusive “Dining on the Dunes” dinners! If this sounds like your perfect holiday to Dubai, give us a call now on 1300 693 822! Retreat to your own private oasis. Al Rimal Pool Villas boast an incredible 158sq. metres of space and can accommodate up to 3 adults (or 2 adults, 2 children). Filled with elegant Arabic décor, intricate lattice woodwork and state-of-the-art amenities, these cool mud-brick structures are absolutely lavish! Wake, well rested in deluxe King or Twin bedding, wander out to your private pool area to admire the stunning desert view. These villas feature a large furnished terrace, cozy seating areas, a 55-inch LCD TV, free Wi-Fi, stand-alone soaking tub and more! 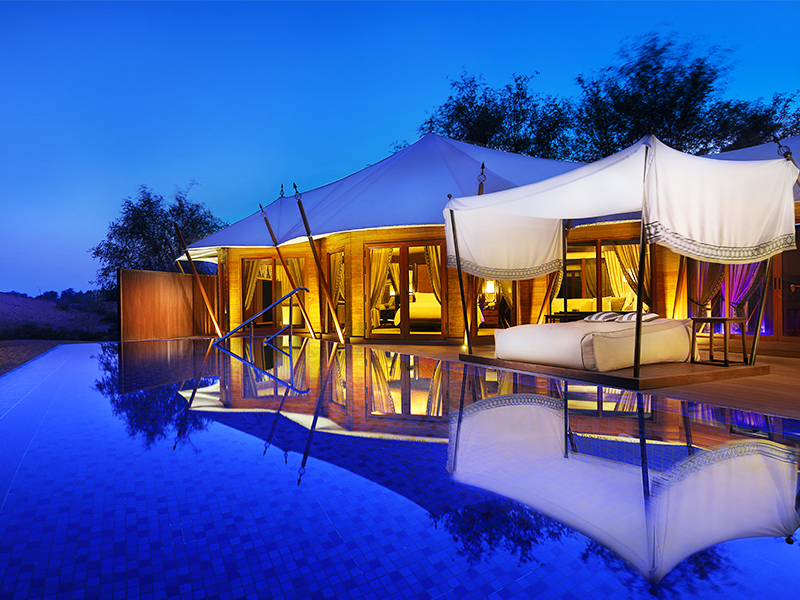 Exuding tranquility, this is the best way to experience desert life! 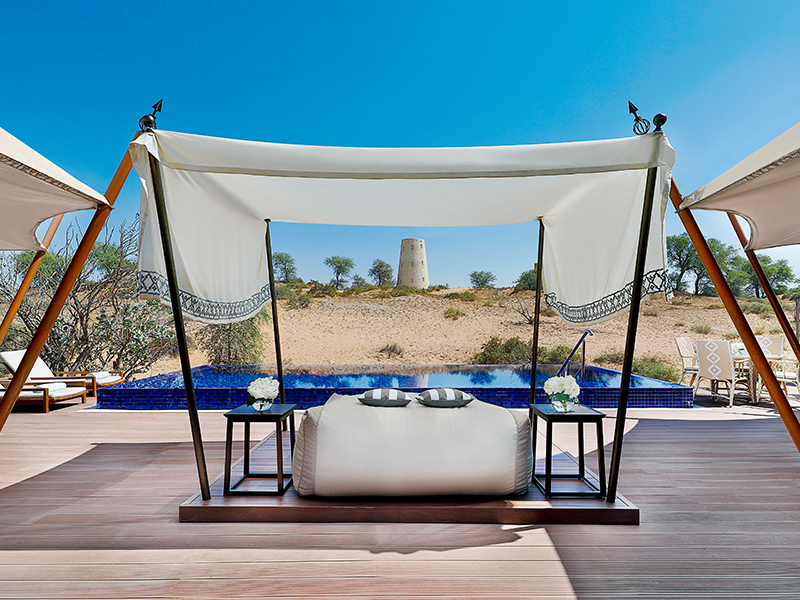 Ritz-Carlton Ras Al Khaimah, Al Wadi Desert is set just under an hour from the Dubai International Airport. Away from the Dubai metropolis, surrounded by the rolling sand dunes of the Ras Al Khaimah Al Wadi Desert, this resort is a true, nature-inspired oasis! When you think “desert oasis”, you don’t immediately think “multiple things to do”. It may surprise you then to learn of all the amazing activities and experiences that surround Ritz-Carlton Ras Al Khaimah, Al Wadi Desert! The desert itself offers endless opportunities for discovery. Over 5000 years of Emirati history is housed here. From forts and abandoned villages, to markets, farms and camel-racing traditions, there’s so much to see and do! Some of the key sites and things to do while at this spectacular resort include Al Jazirah Al Hamra—the Persian Gulf’s oldest and most intact fishing village from the 14th Century, the Camel Races run in winter at Suwan Camel Race Track (starting in October) and Dhayah Fort, located north of Rams Town. These activities range from between 20-minutes and 1-hour away and are well worth the trip if you’re looking for an authentic UAE experience! Incredible! I stayed at this property with my two daughters for 4 nights. It’s very easy to use any number of wonderful superlatives to describe this relaxing and energising oasis. My daughters rode horses, cycled and had very spoiling treatments at the spa. What made the stay such a breath of fresh air was the constant smiling staff who are excited to make your stay as best as can be. The food was delicious and no request was too much trouble. Our travel experts have done the research to handpick only the finest resorts in Dubai based on quality, service, and location. If we wouldn’t stay there, you won’t find it at My Dubai!